Double X Science: Shmeat and Potatoes: The dinner of the future? “Meatloaf, beatloaf, double s[h]meatloaf…” Was little Randy on to something? Food engineering has been on an incredibly strange journey, but there is none stranger (at least to me) than the concept of in vitro meat. Colloquially referred to as “shmeat,” a term born out of mashing up the phrase “sheets of meat,” in vitro meat may be available in our grocer’s refrigerator section in just a few years. But how exactly is shmeat produced and how does it compare to, you know, that which is derived from actual animals? Here, I hope to shed some light on this petri dish to kitchen dish phenomenon. When it comes to producing shmeat, scientists are taking advantage the extensive cell culture technologies that have been developed over the course of the 20th century (for a brief history of these developments, check this out). Because of what we have learned, we can easily determine the conditions under which cells grow best, and swiftly turn a few cells into a few million cells. However, things can get a little tricky when growing complex, three-dimensional tissues like steak or boneless chicken breast. For instance, lets consider a living, breathing cow. Most people seem to enjoy fancy cuts like beef tenderloin, which, before the butcher gets to it, is located near the back of the cow. In order for that meat to be nice and juicy, it needs to have enough nutrients and oxygen to grow. In addition, muscles (in this case, the tenderloin) need stimulation, and in the cow (and us too!) that is achieved by flexing and relaxing. If shmeat is to be successfully engineered, scientists need to replicate all of the complexities that occur during the normal life of an actual animal. While the technology for making shmeat is still being optimized, the components involved in this meat-making scheme successfully address many of the major issues with growing whole tissues in a laboratory. The first step in culturing meat is to get some muscle cells from an animal. Because cells divide as they grow, a single animal could, in theory, provide enough cells to make meat for many, many people – and for a long period of time. However, the major hurdle is creating a three-dimensional tissue, you know, something that would actually resemble a steak. Normally, cells will grow in a single layer on a petri dish, with a thickness that can only be measured by using a microscope. Obviously that serving size would not be very satisfying. In order to create that delicious three-dimensional look, feel, and taste, and be substantial enough to count as a meal, scientists have developed a way to grow the muscle cells on scaffold made of natural and edible material. As sheets of cells grow on these scaffolds, they are laid on top of each other to bulk up the shmeat (hence “sheets of meat”). But, in order for the cells on the inside of this 3D mass to grow as well as the cells on the outside, there has to be an sufficient way to deliver nutrients and oxygen to all cells. Back to the tenderloin – when it is still in the cow, the cells that make up this piece of meat are in close contact to a series of veins, arteries, and capillaries. Termed vasculature, this system allows for the cells to obtain nutrients and oxygen, while simultaneously allowing cells to dump any waste into the blood stream. There are some suggestions that the shmeat can be vascularized (grown such that a network of blood vessels are formed); however, the nutrient delivery system most widely used at this point is something called a bioreactor. This contraption is designed to support biologically active materials and how it works is actually quite cool. The cells are placed in the cylindrical bioreactor, which spins at a rate that balances multiple physical forces, which keep the entire cell mass fully submerged in liquid growth medium at all times. This growth medium is constantly refreshed, ensuring that the cells are always supplied with a maximum level of growth factors. In essence, the shmeat is kept in a perpetual free fall state while it grows. But there is one last piece to the meat-growing puzzle, and that is regular exercise. If we look at meat on a purely biological level, we would see that it is just a series of cells arranged to form muscle tissue. Without regular stimulation, muscles will waste away (atrophy). Clearly, wasting shmeat would not be very efficient (or tasty). So, shmeat engineers have reduced the basic biological process involved with muscle stimulation to the most basic components – mechanical contraction and electrical stimulation. Though mechanical contraction (the controlled stretching and relaxing of the growing muscle fibers) has been shown to be effective, it is not exactly feasible on a large scale. Electrical stimulation – the process of administering regular electrical pulses to the cells – is actually more effective than mechanical contraction and can be widely performed. Therefore, it seems to be a more viable option for shmeat production. Why in the world would we grow meat in a petri dish? Grill it, braise it, broil it, roast it – as long as it tastes good, most people don’t usually question the origins of their meat. Doing so could easily make one think twice about what they are eating. Traditionally speaking, every slab of meat begins with a live animal – cow, pig, lamb, poultry (yes, despite what my grandmother says, this vegetarian does consider chicken to be meat) – with each animal only being able to provide a finite number of servings. While shmeat does ultimately begin with a live animal, only a few muscle, fat, and other cells are required. Given the theoretical amount that can be produced with just a few cells, the efficiency of traditional meat-generating farms and slaughterhouses is becoming increasingly scrutinized. 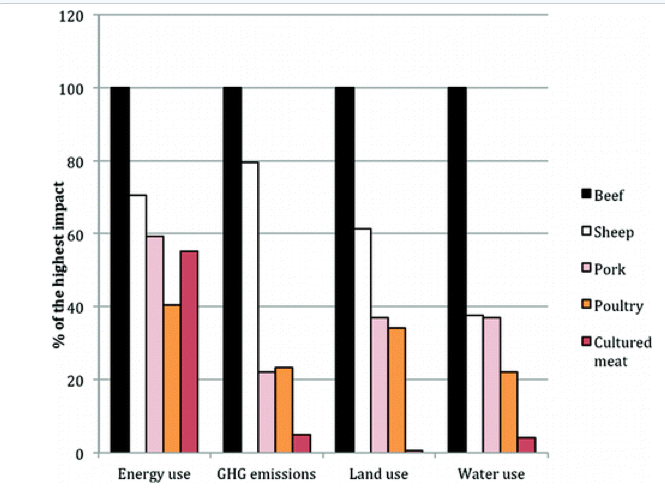 There are obvious costs – economic, agricultural, environmental – that are associated with livestock, and it has been proposed (article behind dumb pay wall, grrrr….) that shmeat engineering would substantially cut these costs. For instance, it has been projected that shmeat production could use up to 45% less energy, compared to traditional farming methods. Furthermore, relative to the current meat production process, culturing shmeat would use 99% less land, 82-96% less water, and would significantly reduce the amount of greenhouse gases produced. The impact of shmeat compared to tradtional agricultural processes. But the potential benefits of making the shift toward shmeat (as opposed to meat) doesn’t stop with its positive environmental impact. From a nutritional standpoint, it is possible to produce shmeat in a way that would significantly reduce the amount of saturated fat it contains. Additionally, there are technologies that would allow shmeat to be enriched with heart-healthy omega-3 fats, as well as other types of polyunsaturated fats. In essence, shmeat could possibly help combat our growing obesity epidemic, as well as the associated illnesses such as diabetes and heart disease. That’s *if* it can be produced in a way that is both affordable and widely available (more on that in a bit). Now that I’ve just spent a few paragraphs singing shmeat’s praises, it is probably best that I fill you in on some of the major roadblocks associated with shmeat production. According to scientists, there are two main concerns: the first is that shmeat production will not be subjected to the normal regulatory (homeostatic) mechanisms that naturally occur in animals (scientists are having trouble figuring out how to replicate these processes); and the second is that shmeat engineering technology has not evolved enough so that it can occur on an industrial scale. Because of these issues and others, the cost of culturing shmeat in the laboratory is very high. But, there has always got to be a starting point. As the technologies advance, the cost-production ratios will decrease and, eventually, shmeat will find its way to the dining table – our dining table. Interestingly, the folks at PETA are all for shmeat and offered a one million dollar prize to the first group who could come up with the technology to make shmeat commercially available by June, 2012. Obviously, that did not happen, and the contest has been extended to January 2013 (this offer has been on the table since 2008). But, the first tastes test for shmeat hamburgers is going down in October of this year. With the world population expected to hit 9 billion by 2050, which will be accompanied by a major increase in the need for the amount of food produced, perhaps shmeat technology will become one of the critical innovations required for our collective survival on this planet. But, there is just one thing: the ick factor. It is a little hard for me to weigh in on this issue because almost all meat seems gross to me (unless it is a pulled pork sandwich, lovingly made by my long-time pal and professional chef – Julie Hall). While most of my peers have less of an aversion to meat, I can’t imagine that they would eagerly line up for a whopping serving of lab-grown shmeat. But, say scientists finally figure it out and shmeat production is scaled up for mass consumption – how will the agricultural sector react? As of right now, the agricultural industry in the USA is worth over $70 billion, with a yearly beef consumption tipping over the 26 million pound mark (of which 8.7% is exported). Shmeat probably has definitely gotten the attention of cattle farmers (and other meat farmers/production companies) and, given the size of this industry, I wonder how much muscle will be used to block shmeat from becoming a household phenomenon. Over all, I think that shmeat is a revolutionary idea as it could have a significant impact on humanity. However, there are many complex questions that need to be both asked and answered. As excited as I am at the thought of not having to kill an animal to eat a steak, I still remain skeptical (though this sentiment may not have been fully present for the majority of this post). 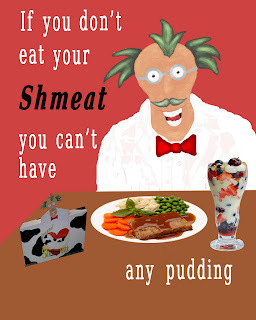 Will shmeat be produced in such a way that it will be indistinguishable from traditional meat? Additionally, will shmeat live up to all of these expectations? I am going to try and keep a positive outlook with this one. Perhaps the next time I actually step foot in a kitchen to prepare a meal, I’ll follow Randy’s lead by making a shmeatloaf, served alongside a heaping side of mashed potatoes. Now that’s some pretty cool kitchen science. **This was a post that made it's first appearance on my old blog, The Mother Geek. Long may it live on Joe Bonner's Google Reader - that's the only place it exists now! (at least that I know). Update: wait, I just found it on Science Seeker!